The 2018-19 Fantasy basketball season is now finito, and here’s hoping you had a great campaign and that our waiver wire picks helped guide you to a championship. Mining the wire can provide value in many ways. Sometimes, it offers a temporary fix to an injury issue or it’s simply a case of jumping on a player delivering short-term value. But when you pick up a player and he sticks on your team for the entire season, or even the lion’s share, and contributes throughout, that is the true definition of waiver wire gold. With this in mind, we rank players higher that were identified earlier in the season as — in theory — they had an opportunity to provide value for your team for a longer stretch. Oh sure, we had plenty of misses among our picks, and because of the bi-weekly nature of our column (for most of the season, at any rate) it means that some hot free agents get scooped up days before we can tout them. But the fact is that if you managed to wind up with, say, two or three of these guys on your team, chances are you were a pretty happy camper this season. Dates in parentheses represent when we recommended each player. 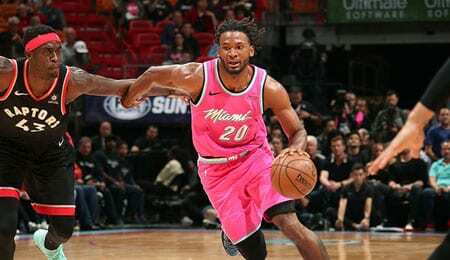 Justise Winslow, SF, Miami Heat (Week Eight): After missing the last half of March, Winslow is finishing strong, flirting with a double-double on Friday and then a triple-double on Sunday. Before getting hurt, his shooting from three point range in March had been better, and all told he’s enjoyed the finest of his four NBA seasons. Winslow got to start far more often this season, and while his FT shooting slipped a tad, he equaled his career best rebounding performance while setting new standards in three-pointers, assists and points per game. The 10th overall pick from 2015 — who can also play some very tough D (see video below) — is poised to take a big step forward next season. Mitchell Robinson, C, New York Knicks (Week Three): Robinson is putting an exclamation mark on a fire rookie season, scoring in double figures in each of the last four games, recording two double-doubles and just missing another pair. On Sunday, he played a career high 38 minutes while putting up multiple blocks for the 28th straight game. Robinson is averaging a double-double with 2.8 blocks and 1.1 steals over the last 10 games. Although we identified him early in the season, it really took until February for him to start consistently seeing enough minutes to become a Fantasy staple, but he’s been a real asset since the All-Star Game, getting to the line more often and doing a way better job on the glass. Dewayne Dedmon, C, Atlanta Hawks (Week 11): Ankle issues caused an early end to Dedmon’s season in late-March, but he enjoyed a career campaign in many categories before getting shut down. He averaged 12.2 points and 9.5 boards in December and 12.3 points and 1.6 blocks in February, but really was fairly consistent from December on. Dedmon’s offensive game has improved the last two seasons, and while his rebounding dipped a tad, he improved in three-pointers, FT shooting, blocks, steals and points. It’s taken him a while to come into his own, and once he has his ankle issue dealt with this summer, he could be in line for even more next season. Patrick Beverley, PG, Los Angeles Clippers (Week Five): One of the top defenders in the NBA (10.5 per cent of NBA players named him No. 1), Beverley has provided periodic help on offense too. Right now, he’s dealing with a hip woe that has cost him the last three games, but in March he averaged a season-best 4.8 assists. Beverley’s PT is down this season, so he’s sinking his fewest field goals since he was a rookie, and while his FT shooting has also slipped, he’s made up for it by enjoying one of the best rebounding seasons of his career. Marcus Smart, PG, Boston Celtics (Week Seven): Smart is dealing with an oblique strain down the stretch, one of several injury concerns the Celtics have with the playoffs around the corner. Still, he stayed healthier than ever this season, getting a chance to start most of the time. Despite that, he actually saw less PT and didn’t sink as many field goals, but enjoyed his finest campaign from beyond the arc. A relentless defender, Smart’s shooting touch was finally less of a liability this season. Dwyane Wade, SG, Miami Heat (Week Seven): Very seldom over his 16 year career has Wade been available off the wire, but that was the case this season and he proved to be an astute pickup. He’s finishing with a flourish, scoring at least 16 points in each of the last five games and averaging 17.1 over the last 10. Flash is likely retiring at the end of the season, but he enjoyed a nice comeback season, staying healthier, getting more touches and putting up his best effort since his lone campaign with the Bulls. Over the last two weeks, this future Hall of Famer has provided top 100 value, his best stretch of the season. Bogdan Bogdanovic, SG/SF, Sacramento Kings (Week Five): One of several young and talented players on the up and coming Kings, Bogdanovic has seen a smidge less PT down the stretch, but is still producing at a high level. He’s averaged two treys over the last two months, and despite not shooting as well as he did in his rookie season (from the floor or the line), he’s improved in other areas (rebounding, assists, steals and points). Small wonder Bogdanovic was named to the World Team in the Rising Stars game during All-Star Weekend. Terrence Ross, SG, Orlando Magic (Week Seven): Ross’s hustle was huge for the Magic and he went ballistic to end the season, scoring at least 23 points in three straight games. He slumped a tad in March, but sure came to play in April to help Orlando earn its first playoff berth since 2012. In the clinching game on Sunday, Ross went off for 26 points as the Magic swept the Celtics for the first time since 1996-97. British rockers Led Zeppelin launched its career in 1968, releasing classic album after classic album until 1980, when the band broke up after the death of drummer John Bonham. In 1970, Zep put out its third album, ingeniously called III, featuring “Bron-Y-Aur Stomp,” named after the cottage in Wales where Jimmy Page and Robert Plant held a songwriting session that really helped alter the band’s sound. Now it’s your turn. Let us know in the comments below which Fantasy basketball waiver wire picks helped you the most this season. This entry was posted on Thursday, April 11th, 2019 at 11:19 am	and is filed under BASKETBALL, RotoRob, The Wire Troll. You can follow any responses to this entry through the RSS 2.0 feed. You can leave a response, or trackback from your own site.